When I was young I studied at Bristol University, and stayed there for a year afterwards. I still have friends and relatives living there, and visit regularly. It is the first city I came to know and love as a place. I still love it, with its famous and dramatic gorge, its stone-faced houses, its hills, its green spaces, the way that any street corner can open up a whole new vista. But the things that made the city what it is are not so beautiful: Bristol grew rich on the slave trade, the tobacco industry and, more recently, the arms trade. And of course, as in any city, there is a dark side hidden away out of sight of the parks and the gorge and the gaily painted terraces winding up and down the hills. Behind all this, as in any British city, are pockets of grimness and deprivation (something I tried to portray in my novel Marcher) which few people ever see if they don’t have occasion to see them out. So, like Ursula le Guin’s fictional Omelas, Bristol’s charm and beauty stands on a base of hidden suffering. The same could be said of much that we value in the developed world. We all know of course that what counts as an average sort of life-style in our part of the planet – car and house ownership, TV, computers, smart phones, annual foreign holidays, meat every day, an office job, a hot shower every morning – is in fact, in global terms, exceptionally wealthy and privileged. Most of us are probably also aware that part of the reason for our ability to access so much in the way of consumer goods, is that the producers of the raw materials, and very likely the producers of the goods themselves, are paid much much less than we are. 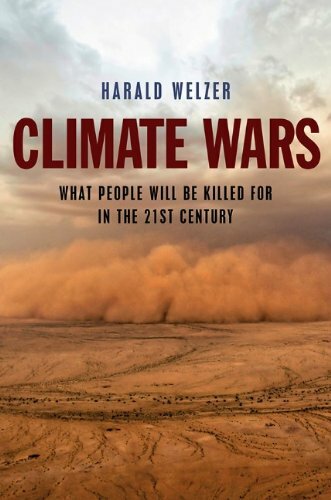 We may also be dimly aware – Harald Welzer makes this point rather well in his interesting book ‘Climate Wars’ – that our way of life is also underpinned by more or less constant violence and warfare. Long chains of responsibility can make this less obvious – the violence typically takes place far away from us, and is rationalised in various ways – but it takes constant and large-scale application of brute force to secure our access to the resources required to maintain our lifestyle and to secure our frontiers so that not too many people come and share our bounty with us. There are several strategies for dealing with the potential for discomfort arising from these facts. One is simply to shrug them off, ask ‘Who ever said the world was fair?’, and indicate our intention to defend what we own and have worked for. Another is to place responsibility for poverty on the poor: ‘It’s up to them to sort it out. No one ever helped us.’ Another is to absolve ourselves by pointing to some abstraction – ‘It’s capitalism!’ is a common one, as if capitalism had some sort of autonomous existence, and was not simply a name for a nexus in which most of us are complicit – or to people even wealthier than we are: ‘SUV owners’, for instance, are great targets for ordinary car owners to point to. Another again is to argue that, wealthy as we are by global standards, we are somehow helping to bring the rest of the world up to our level (there are various versions of this last one, including a capitalist narrative of world development, socialist narratives about building a new world order, and more personal narratives built around activity such as charitable work). What is clear though is that the whole world never can come up to our level. There is a finite and, in many cases, steadily diminishing supply of resources: agricultural land, water, copper, zinc, coltan, oil, phospates… There is a steadily increasing number of people. Meat every day for everyone, for instance, may require more agricultural land than actually exists (because growing crops to feed cattle is a much less efficient use of land than growing crops for human consumption), even before one factors in the future lack of availability of phosphates for fertilizers. So the comforting idea that, wealthy and privileged as we are, we are helping others to one day reach our level, is false, because we are rich not only in purely relative terms (that is: rich by comparison with the world average), but rich in absolute terms. We are already using more of the world’s resources than could ever be available to the entire population of the planet. No wonder all that violence is necessary! Pressure on resources will become more acute as increased population, and increased competition from emerging economies, and as climate change (itself a side product of our consumption of resources) increasingly provides an additional stressor: large areas of the world may soon no longer be able to support the population that they once did. In this context, violent conflict over resources and borders will proliferate – Welzer proposes that the Darfur conflict in Sudan is an early instance of a climate war: two ethnic groups, who were once able to coexist, have there been brought into conflict by a water shortage which means they both need access to the same land – and wealthier parts of the world will have increasingly to deploy force to protect their privileged position. Fascinating post Chris. I’ve been thinking about this a lot recently and I’ve discussed the possibility of not eating meat with the kids (I think I’ve got a little more convincing to do!). Maggie is a vegetarian, so I only rarely eat meat. I quite like preserving it as a treat.